Q: How much is this device going to save me a day, month or year? How long will it take to pay for itself? A: The daily solar power you put into the grid is basically taken off your power bill. So it depends on the wattage of your panels, GTI's, batteries and solar conditions in your area. The savings add up daily and at the end of the month or year. You own the solar panels, they are worth something, you don't get that when you throw money at the power company. What else can you buy that will keep on giving you a return for 25 to 35 years+ after you recoup your initial investment? At what point do you get any "payback" from the power company? Does anyone think about that? Any power reducing modification on a piece of real estate will increase the property value. Q: How hard is it to install the GTI Controller? A: It's basically 2 wires in (+/-) from the batteries and 2 wires out to the Grid Tie Inverter (GTI). 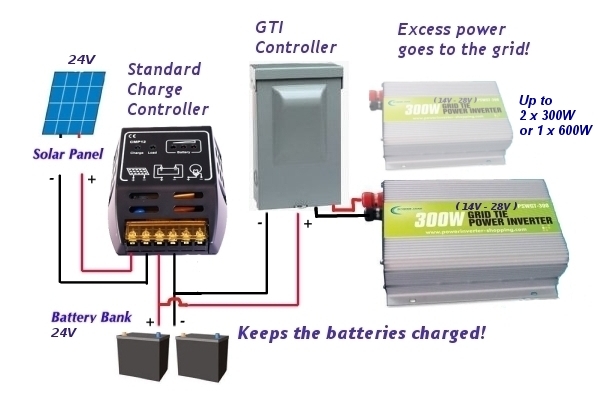 Think of it as two different systems, one is a basic solar panel to charge controller system, then the other is the GTI Controller system connected to the same batteries. You should have basic electrical skills for DIY or contact an electrician, and knowing how to hook up wires to things like home electric sockets and appliances and how to use a volt/ohm meter. You should have a solar disconnect switch outside at the solar panels. It's always good to have a helper nearby whenever you work on electrical devices. Hardware stores and YouTube have online videos showing how to do home electrical wiring. Always work with the batteries disconnected until you have double and triple checked all your connections, and with a meter. Saying it again: ALWAYS DISCONNECT THE BATTERIES ! Connect as directly to the batteries as possible so the GTI Controller can sense their voltage directly and GTIs have direct power from them. The included 30A fuse goes on the positive (+) side from the batteries. Wiring diagram is in the installation manual. Q: What solar panel size do your recommend and how many? A: It's up to you depending on the GTI's and your batteries and power requirements but the typical install would be two 24V 220W or 250W solar panels = 440W to 500W with 500W to 600W of GTI. This could also be four smaller 12V panels. Minimum panel wattage should be at least 250W or above for a smaller system, and one 300W GTI. Q: Why can't I hook up my solar panels directly to the solar controller input and the GTI input at the same time without your device? A: They fight each other, the battery does NOT get priority first thing in the morning, and on cloudy days the GTI takes everything. You can try to manage that manually if you want but why bother? Q: What is the recommended box and why doesn't it come with one? A: You simply buy a Eaton box locally, then mount and wire the unit. 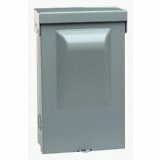 The hardware store metal electrical disconnect box we recommend for this system is the Home Depot or Lowes Model Eaton #DPU222RP $7 and used to mount the device and provide covered protection. [ Click HERE for a link to the Eaton Electrical Box at Home Depot ] We can't sell and ship you a box for $7 and you will probably take a trip there to buy a nice piece of plywood for backing and some wire anyway. For $7 you get a disconnect switch, wire connection terminals and a nice enclosure with no extra shipping charges! The Eaton disconnect box is UL Listed #E132354, ANSI certified, CSA Listed, and meets 2008 NEC Article 422.31 (B) requirements. The Eaton box gets only slightly warm at full recommended wattage. Do not buy the GE box that looks the same, it's too small inside and the controller won't fit. Q: Can I mount the GTI Controller outside? A: No. The circuit should be mounted inside away from rain and moisture. Q: Can I throw 5,000W of panels at it? A: If your charge controller handles that why not? A second or third GTI Controller will also work in parallel with another GTI Controller, you can "stack" as many as you want. You should size the GTIs to the extra energy you expect to have or it will probably go into float mode more and you will throw energy away. Meaning generally your GTIs wattage and your other battery loads (inverters etc..) should exceed the solar panel wattage so that the GTI can run down the batteries a little and cycle on/off only when extra power is available. If you have some other load on the batteries, then any extra energy will go to the grid when the batteries are at a high enough voltage to trigger the GTI. We recommend that you start small, monitor things, then see how it goes before adding more panels. Managing inverter loads for daytime and nighttime is always a pain. This is why it's better to have batteries ready for power outages and use the grid otherwise if you have it. Q: When I add more panels, is it in parallel or series? A: With two 24V solar panels generally they are in PARALLEL, but with some newer MPPT charge controllers you can go to a higher voltage but still use 24V batteries. Beware that the switching mosfets in charge controllers can fail SHORTED and overcharge your batteries and there is no way to protect from that, ask your charge controller manufacturer about that! And now you are wondering what happens if the GTI Controller mosfet fails shorted - your batteries would probably discharge to the lowest voltage of the GTI, sorry but at least acid doesn't fly in your face like a shorted MOSFET on a charge controller at high voltages could do. One save for that is the fact that solar panels will pull down in voltage if overloaded, but this "save" depends on each system's panel wattage, battery size and load. You do not want to exceed the maximum voltage for this device, or push it to the limit. You just don't do that with electronic equipment no matter how well it's designed. Be reasonable and conservative please. We recommend that you start small, monitor things, then see how it goes before adding more panels. Q: Could I use this with a Wind Turbine? A: Yes, anything that charges 24V batteries will work. You should use the recommended charge controller. Q: Can I run this on a 12V system? A: Yes. But it's not the best setup. You need to have a special 10.8V to 28V GTI that they sell on eBay. The GTI Controller will adjust down to that and it's a good starter system as you move up to 24V which is better in a lot of ways. Most people should run a 24V system, it's more cost effective with less wire loss plus less amps that make it easier to work with and the GTIs respond with better output. Q: Why not use a inverter with batteries every day and deep cycle them? A: Batteries are expensive, messy and need maintenance. They have about a 5 year lifespan or less depending on usage, and a limited number of deep cycles, some are better, some are worse, then you have to replace them. You have to size your batteries and panels with your daily AC loads which is hard to do since no one uses AC appliances exactly the same way every day. Weather conditions change and so does your power production. It's not a lot of fun always adjusting your loads to your daily system output. At night your batteries may run down and your inverter shuts off, so you need to somehow automatically switch back to the grid, that's another expensive piece of equipment you need, a transfer relay. Then, every day you have to reset your inverter. You may want to connect into your electrical box for selected circuits, more expense. Or maybe run extension cords all over the house, nice. Good extension cords are not cheap. The GTI Controller pulls a little power from the batteries but it doesn't deep cycle them so battery lifetime should be better than a off grid system that deep discharges the batteries daily. You basically use the grid as a BIG battery and then use the energy back later when you need it. Q: Why do you say it's a partly assembled and tested kit? A: You simply buy a Eaton box locally, then mount and wire the unit. The GTI Controller comes as a partly assembled and tested kit, the electronic circuit is fully assembled and tested and mounted on it's heat sink, you provide the enclosure/box, wire and mounting methods. No soldering required. Typically a hardware store metal electrical disconnect box (Home Depot or Lowes Model #DPU222RP $7) is used to mount the device and provide covered protection. [ Click HERE for a link to the Eaton Electrical Box at Home Depot ] We can't sell and ship you a box for $7 and you probably want to buy a nice piece of plywood for backing and some wire from Home Depot anyway. Q: Should I use metal conduit for all the wiring? A: We recommend using metal conduit for several reasons, first is to protect your expensive wire from the sun, next would be to keep the little critters from eating through the insulation since they do climb on roofs, third would be for fire protection in case of a high ohm contact which would heat up, fourth would be possible lightning protection because typical wire insulation is 500V to 1000V and lightning (100 million volts plus) will seek the ground potential of the metal conduit and POSSIBLY save your equipment, lightning is wild so you really can't protect 100% for a direct strike. Panels should be grounded as direct to ground as possible. Q: What size wire do you recommend? A: We recommend using #10 AWG wire minimum with the GTI Controller and 5 ft max length to/from box/batteries, shorter is better, larger diameter wire is better of course, possibly up to #6. The fuse should be sized to protect your wires and as close to the battery as possible, also big enough for the GTIs you are running. Q: Should I have a outside disconnect? A: We recommend putting a disconnect outside for your own convenience when working on your system and some fire departments suggest them because they don't know the voltage of your system. Some solar systems run at over 600V and are dangerous to fire personnel. Any disconnect should be labeled. Some codes require a lockable disconnect outside. Solar panel wires should be put in metal conduit for safety. Q: What National Electrical Codes (NEC) might apply to a installation? 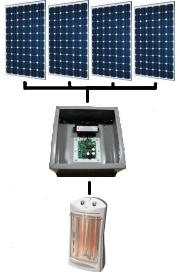 A: This is a low voltage DC off grid system not connected to the electrical grid "mains". For homeowner DIY installed equipment in single-family dwellings it may be exempt in your area, check your local government codes. Generally speaking, and this is not an exhaustive list, NEC Article 409, 312, 314 and 690. Article 409 covers "Industrial Control Panels", which are enclosures for general use and operating at 600 volts or less containing circuit protection devices, relays, electrical circuits and connections. Article 312.5 requires the use of proper fittings at enclosure openings, to protect and secure the cables and wiring for example, which just makes sense. Article 314.4 requires all metal boxes to be grounded (bonded), which is always a good idea. So generally, Articles 240, 250, 312, 314, 404, 409, 690. There are other requirements when using systems over 150V and some at over 50V stated in Article 690 such as a need for a outside disconnect, DC-GFP (GFI like device) and Series Arc Fault Detectors. When enclosed in a metal UL approved box such as the Eaton box, NEC 409 applies as this is electronic control equipment or a "Industrial Control Panel". When all wires are inside metal conduit and the metal box cover is closed this system is as safe as is humanly possible for electrical equipment of this voltage and amperage. We always recommend to have a qualified electrician do any installation, especially with voltages over 90V. Q: What about the equalize charge mode on my charge controller? A: Most charge controllers that have a equalize mode are intelligent enough to detect a load on the batteries (the GTI) and not try to do a equalize charge. It's a good idea to do a equalize charge every few months, so you would have to do them manually and disconnect the GTI Controller during the short equalize period. Q: What do I do about a fancy charge controller that "absorbs" or "tops off" at a higher voltage? A: When your battery reaches it's highest charge voltage it is generally charged and not taking in much more energy. Nothing is perfect and there are tradeoffs here because you also want to start using the solar panel's TOTAL energy for something else and not topping off the battery. Some controllers call it "absorb" but it is really a topping off of the charge and you are not using much of the solar panel's energy at that point. So generally you want to look up your battery's particular charge voltage and turn on the GTI at that point or a little above it so you know it's pretty much fully charged. Later in the afternoon (on a good day) the batteries get a limited topping charge when the solar panels can't push enough power to bring the batteries up to the point of triggering the GTI, which means the batteries sit nicely at about their charge voltage for a while, basically "topping off" for the day. Q: What are the LED blinking indications? A: Slow blinking shows it's working, powered up and CPU is running OK, this happens when voltage is applied. Fast blinking happens when the GTI is energized, meaning you reached the trip voltage point you set with the adjustable pot. You should see this in the videos. It will continue to fast blink until the internal 2 minute timer runs out. Q: What were those little charge controllers in the Youtube video? A: The CMP 12/24 Charge Controllers in the video are slightly modified with a small heat sink added since it was found that the mosfets could handle more current, the traces were also beefed up, see the post on the TechLuck forum about them. They are simple charge controllers found on eBay for a very low cost. It is actually better to use a simple charge controller that allows you to adjust the voltage so you can get your system just right. The idea here is to keep the batteries topped up and not spend a lot of money on fancy chargers when it's not needed. Some of the more expensive charge controllers may not let you set the charge voltage. Q: What were those fans shown in the Youtube video? A: The fans shown in the video were actually old PC power supplies cut up so you can use just the fans, see the Youtube video about how they were made. The GTI Controller is Patent Applied for. Just right-click (Mac users HOLD button down) on this link, and then select "Add bookmark for this link" for Firefox or "Add link to favorites" for Internet Explorer. · FREE ENERGY ROOM HEATING IS HERE ! Copyright (c) 2013 TechLuck.com. All Rights Reserved.